In the search for an understanding of New York's new governor, here's one more tidbit for the pile. When it came to Megan's Law, he was the rare rational legislator. Sexual offender registration and notification laws - Megan's Laws - sailed through every legislature where they were introduced. Backed by powerful anti-crime groups (many framed, accurately or not, as child protection organizations), these bills drove potential critics into silence. In my 2001 article, Making the Case for Megan's Law: A Study in Legislative Rhetoric, I documented the legislative debate over these laws in both the U.S. Congress and the New York state legislature. In the U.S. House, Megan's Law passed by a415-3 vote - and only one Representative (Mel Watt of North Carolina) expressed any concerns about the law. Several New York legislators felt a bit freer to articulate their anxieties about the law. Then-Senator Paterson spoke at least once questioning the efficacy of the bill, noting that because the majority of sexual assaults occur within the home, relatively few ever result in conviction. This small insight might seem so minor as to be unworthy of mention. But because opposition to Megan's Law was so politically radioactive, his willingness to offer up any critique at all was notable - for several reasons. First, he was willing to publicly articulate concerns about a third-rail issue. Second, his critique - ineffectiveness - was sound. Even if Megan's Law helped reduce recidivism among those on the rolls, the overwhelming majority of offenders would never be convicted - and therefore never subject to Megan's Law. Finally, he was pragmatic - the bill was going to pass ovewhelmingly and he appears to have ultimately voted for the bill (as did all but one of his fellow critics). This is all consistent with what we're hearing about Paterson more generally. Progressive and pragmatic. The New York Times reports that Alabama has adopted a new law to prevent children from being exposed to drugs--in and out of the womb. The district attorney in Andalusia, AL argues that pregnant women should be prosecuted for using drugs, saying that "When drugs are introduced in the womb, the child-to-be is endangered." This concept of chemical endangerment of a child targets meth towns--municipalities with little diversion outside the chemical. Most often, these victims are white, poor, and young. Babies born with traces of drugs in their system provide evidence of the mother's drug use. State officials hold that they are protecting mothers and children, but those prosecuted think otherwise. The article my be found here. Interesting juxtaposition of two articles out of the ABA Journal this week. Justice Kennedy, speaking to a House Subcommittee yesterday, called for an increase in judicial salaries to keep the nation's best judges from fleeing to private practice. According to the ABA Government Affairs Office, district judge salaries stand at $165,200 per year, much less than some big firm salaries for even junior associates. But judges looking for a salary bump should think carefully before jumping ship, at least if they're considering a move to O'Melveny & Myers. The Journal reports that the international mega-firm made a temporary buy-out offer to partners over age 50. The offer is "voluntary," and an earlier report says it is not aimed at partners with self-sustaining client lists, but those no longer interested in billing 2,000+ hours a year. Only a few blog comments to the report so far this morning, but I tend to side with the bleeding hearts. No-one wants unproductive partners draining the salary pool, but I wonder what characteristics the deciders at O'Melveny look at to determine if a colleague is worth keeping. Sure money matters, but I would think the firm itself would benefit from a partner who actually has the time to mentor, tutor and support a junior associate. And that's not going to happen as often as it should if everyone's trying to top 2000 billables a year. The intangibles matter, even if we cant bill them to a client at $750 an hour. And besides, isn't 50 the new 30? We used to think my brother loved pickles. I'd hear him in the morning while our Mom was packing our lunch for school, "two cups, Mom, don't forget!" We found out later, about 20 years later, that my brother didn't really like pickles at all - he only liked peddling pickles, a dime a pop, to the pickle fiends he knew from class. He didn't break the bank, but always had extra change for Gatorade after practice. Gatorade he liked. My brother's known for being financially savvy, very entrepreneurial, so when he confessed his business on the side I wasn't too surprised. I'm not sure the teachers or administrators knew about it, but I'm not sure they would have cared too much either. But it wasn't 2008, and we didn't go to school in New Haven, Connecticut. Apparently, in New Haven, you can be tossed from the student council, barred from an honors reception, and suspended for a day of school if you're part of a pickle-peddling scheme, well, maybe not pickles, but a special kind of contraband nonetheless. Findlaw reports this is precisely what happened when an 8th grade honors student was caught dealing Skittles with a classmate in violation of the district's health and wellness policy. Skittles, the crunchy, candy contraband. I'm 100% behind nutritional education and curing our addiction to high fructose corn syrup. Especially among kids. I remember well the Reagan Administration's absurd attempt to pass off ketchup as a vegetable, and now live in a district that serves "frito pie" for lunch. Recipe here for those so inclined. But (arm chair quarterbacking, here) I'm not sure this was the best use of school resources, especially at time when New Haven, according to the report, was in the middle of student testing. Ultimately the boy's disciplinary record was expunged and he was reinstated to his VP post, but only after his parents complained, and the district Superintendent became involved. For Skittles? Maybe there's more to the story than we know. Surely there's some merit in teaching kids to follow the rules, sometimes, whatever they happen to be. And maybe there's something other than nutritional wellness at play. Hey, if graffiti can be a gateway crime, maybe Skittles is a gateway drug? All I know is my brother's more financially stable than I can ever hope to be, and I attribute that to some pretty innovative business ventures he took up in the 8th grade. Call it a blogger confessional. I know that I haven't been putting up hugely substantive posts of late. Those entries take more time and concentration than I can currently muster - in part because I am teaching my entire year's teaching load during one intense 9 week quarter. But that doesn't mean I don't have fleeting thoughts I'd like to share...or interesting links that I' ve discovered during the 60 minute decompression period between classes. This morning I had a good laugh watching this clip from the Colbert Report - a gotcha segment on a 6 year old girl who is headed down the wrong path. Personal guilt of a self-articulated crime has become common parlance of contemporary political life. Gov. Spitzer’s recent allegations of involvement with a prostitution ring, high-class or not, only prove this truth further. The most righteous of public figures have the farthest elevation to fall. The velocity only accelerates as the candidate approaches final ground. Thuds are much louder when the person holds the weight of fame. Extremism, or even avowed profession, establishes a historical touchstone for deviance. Even in the most understandable and believable declarations of fortitude or disgust, nonconforming behavior can exist. As early as the seventeenth century, British author Samuel Johnson asked “How is it that we hear the loudest yelps for liberty among the drivers of Negroes?” Very public enunciations run in tandem with very private transgressions. If liberal professors are so bad and so biased and so detrimental to education, then don't go to those schools. The reality is people don't actually believe this crap, they just want to use it as yet another GOP red herring -- this time to try to pass bills as reckless as that of the Arizona legislature. It's another card in the "every environment must have two giant yelling heads who disagree" school of thought. It's so anti-academic freedom it's absurd. And while I feel bad for whoever got a C on here, the anecdote proves nothing. And time and time again these silly arguments about the bias in universities are nothing more than that: Anecdotes that are less than completely unverifiable. Are we really using the word 'Leninist' and expecting to be taken seriously? That too easily bandied word should be thrown into the 'Nazi' pile. Belle Lettre has a good list of interesting posts on Eliot Spitzer here. As always, sometimes, the Smoking Gun has the primary documents here and here. Update: I'm behind the curve. The "sealed" complaint is here. 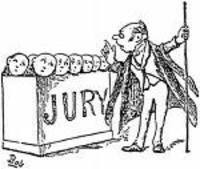 Despite the fact that a good 95% of criminal indictments are disposed through guilty pleas, the jury trial--and the right to a jury trial--still looms large in the American imagination. For better or for worse, our nation is obsessed with the criminal jury trial. And it's been a focus since the founding of the country: the right to a jury trial is codified twice in the Constitution, once in Article III and once in the 6th Amendment. But whose right is it, exactly? Currently, we understand it as the defendant's right--that's certainly how the 6th Amendment seems to read. But what if that's wrong? What if, originally, the jury trial right was a community right , and was never intended as an individual right? What if we had spent the last century misunderstanding and misreading the Bill of Rights, contrary to the original historical meaning? What would that mean for the individual jury trial right today? That's the premise of my latest article, sent out to law reviews last week (and available here in draft form). Full abstract after the jump. Who Knew College Teachers Had To Sign Loyalty Oaths? As a Quaker, [Cal State East Bay teacher] Kearney-Brown is committed to nonviolence and was unwilling to sign the state oath of allegiance that required her to "swear (or affirm)" that she would "support and defend" the U.S. and California constitutions "against all enemies, foreign and domestic." She tried inserting the word "nonviolently" in front of the word "support," but was told by university officials that altering the oath was unacceptable. Is this more a story about the inappropriate use of loyalty oaths or a massive bureaucracy that processes an incredibly personal (and powerful) personal affirmation like a HIPAA waiver at the doctor's office? In the end, lawyers with the state AG allowed her to append the following statement: "Signing the oath does not carry with it any obligation or requirement that public employees bear arms or otherwise engage in violence." Saddest of all is that the rare person who actually read and cared about the oath was the one who got rolled under the bus. My favorite librarian was excited to see a Walker Evans photograph used to illustrate a story in the most recent issue of NYROB. It appears with Jason Epstein essay on Michael Pollan's In Defense of Food. The story (entitled "A Way to Think about Eating) is about eating habits and how people throughout the world are now adopting the (self-destructive) eating habits of the west. The illustration (at left) is of a roadside stand. 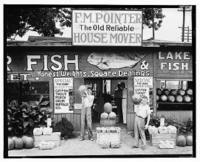 The caption reads "A roadside store between Tuscaloosa and Greensboro, Alabama, 1936; photograph by Walker Evans." Now, it isn't every day that national magazines print Walker Evans photographs, though perhaps they ought to do so more often, because there are some really, really beautiful scenes. Hmm, I thought; I travel the road between Tuscaloosa and Greensboro a bunch and I don't remember seeing anything that might be a remnant of that store--I'll have to look for this next time I'm down that way. There are, though, quite a few remnants of stores along the way--and that's worth a post at some point. So that set me to looking through the Library of Congress' website for more details, which might be helpful in locating the building. You can imagine how pleased I was to find an entry for "Roadside store between Tuscaloosa and Greensboro, Alabama"! Of course, when I clicked on it, I found not the picture above, but the one on the right. A little more digging demonstrated that the NYROB caption was wrong. 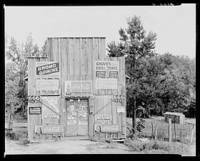 The picture above is actually "Roadside stand near Birmingham, Alabama." Ah well, what the heck--they're both really great photographs and, as I say, it's awesome that either of them as presented to readers today. I think you'll love the Library of Congress' website with photographs from the Farm Security Administration and the Office of War Information Collection. They provide hours of entertainment. This week we learned that Oscar winning best actress, Marion Cotillard, thinks that the World Trade Center may have been taken down by Americans seeking to avoid the high costs of building renovation. Oh, and that maybe people never actually landed on the moon. It's hard being famous, no doubt about it, but this nice YouTube video shows that Marion wasn't the first person to seriously question this whole "man on the moon" story. U.S. postal authorities have approved more than 10,000 law enforcement requests to record names, addresses and other information from the outside of letters and packages of suspected criminals every year since 1998....In 2004, 2005 and 2006, the most recent year provided, officials granted at least 99.5% of requests, according to partial responses to inquiries filed by USA TODAY under the Freedom of Information Act. The numbers are fresh, but I suppose the issue itself is old news. On one hand, I find it very disconcerting that the recording of such information requires no warrant - and that George Bush takes the position that no warrant is required even to open mail. (I'm also always a bit taken aback when I find Bob Barr in my foxhole.) On the other hand, this seems to be one more piece of evidence that we are quickly morphing into a surveillance society. Perhaps it's inevitable given modern technology's remarkable data recording, retrieval, and mangement capacity. You can't give the FBI new toys expect it to leave them in their boxes! In any case, it does appear that there might be a market for "social activist" communication services: package delivery companies and telecom providers which, for a small additional charge, demand a warrant before releasing information. A new niche for Working Assets? Are Law Reviews Guilty of Letterhead Bias? Unlike the rest of the academic world, legal scholarship is largely published by students. Those 2Ls and 3Ls we teach in our classes are the editors of our articles, the basis of our promotions, and the gatekeepers of placement. Students, as are laypersons, can be very impressed by name recognition, and so are faculty. Prolific writers at the top of their field publish in well-regarded journals and consistently place their articles in top law reviews. A similar pattern happens for faculty, of whatever rank, at highly regarded law schools. Professors at Top 20 law schools publish in Top 20 journals. An argument can be made that good scholarship, from whatever source/law school will get a good placement. But is this always true, that the cream rises to the top? Could a any good scholar place an article in a Top 20 journal? Or, the better question is, how often has that happened? Are student editors guilty of letterhead bias, or is some scholarship from certain schools just better than others? Comments, testimonies, and discussion are encouraged. Where's the Carter Center when you need them? 1. No-one knew the rules. We were first told by someone who seemed to have authority (we weren't sure who they were exactly) that doors would shut once caucusing began, and no-one could leave until the night was over. Of course dozens of voters immediately bolted for the door until a woman from the Clinton campaign told us that was incorrect, we could leave and come back. Caucus organizers asked us to "be patient while [they] figure out the rule." The problem: No-one had a copy of the caucus rules, save for one savvy lawyer who showed up as a citizen, not as a caucus organizer. She had the printed rules. 2. Towing cars. About 2 hours in, a police officer went on stage to announce they were about to start towing cars. Dozens more bolted for the door - voters who showed up at 7:15 ready to caucus, not knowing that the streets were unavailable for parking. Some came back, but then were told by one presumptive organizer that they couldn't vote because they left the room, but by another that they could because they "signed-in" at 7:15. But no-one "signed-in" at 7:15. You just showed up. We're we supposed to sign in? See problem #1. 3. Caucus Rosters: There were not enough voting rosters to sign. I saw one, on a clip board being passed around to voters in the auditorium seating areas. It had an official control number, bolded in red, which I assume was used to keep track of the number of rosters distributed. That is, if 10 rosters are distributed, I assume you want 10 rosters back. You can't tally the vote if you've only got 8 because that means 2 are still floating around. Yes, I said floating around. We ran out of rosters, so an Obama organizer pulled out a yellow legal pad, drew a series of improvised columns and rows, and told us to vote on that. "Yellow legal pad", I asked. No control number? How many of these are being distributed? How many would they get back? Are the Obama people supposed to be collecting signatures? The Clinton people were collecting votes in the precinct seated next to us. Doesn't seem right . . but . . . ok . . . I guess. Is that right? 3. Proof of Primary Participation. We were first told we needed to present our voter registration card to caucus. Then we were told to present our receipt from voting in the primary. Then we were told that if we didn't have either of those we couldn't vote. But wait, the Clinton woman told us we could vote. That they'd asterisk our name and check it against the primary voter list. Is that right? More people left. Did they even have a primary voter list? 4. Allocating delegates. Fifteen delegates were allocated to precinct 189, my precinct in Oak Forest. Delegates are allocated proportionally according to the "votes" that are "tallied" for each candidate. But there was a problem with the allocation because the precinct chair kept coming up with 1 delegate for Clinton and 1 for Obama, after apparently dividing the number of "voters" by the number of "votes," and doing that for each candidate. I'm no math whiz, but X divided by X is 1 no matter how many candidates are running. Someone apparently stepped in to explain the concept of proportional delegation because at the end of the night we were told that Clinton received 9 and Obama received 6 delegates. Who knows. I asked my Con Law students on Wednesday to report their experiences and they all had similar tales to tell. One of my students was even elected a delegate chair because, as he put it, "I guess everyone thought I was qualified because I'm in law school." They didn't have enough voting rosters either, so he pulled out his draft legal research and writing brief, and created a roster on the back of the pages. Good effort, friend. Its not your fault. Sometimes we laugh instead of cry in the midst of chaos and uncertainty, and there were moments of spontaneous laughter at the chaos that was the caucus on Tuesday night. And I suppose on one level the absurdity would still be funny, that is, if we weren't TRYING TO ELECT A PRESIDENT!! Frankly, I'm not convinced that a well armed student body will make us safe from incidents like Virginia Tech or Northern Illinois. It's not like those shooters are rational actors open to deterrence. And I'm doubtful that having a flock of fellow students returning fire would be a net benefit. It's one thing to arm commercial pilots. Many of those folks have serious military training and pilots are uniquely exposed to risk. If we take seriously the right of students to bear arms in school, I know I'll worry that my classes are filled with weapons - but not necessarily people with the skills and judgment to use them appropriately. Update: The 2009 US News law school rankings have been leaked prematurely. For more information, visit here. Whatever you think of the actual rankings - and people have certainly opined on this issue - U.S. News has created a property that has a signficant impact on law school admissions - on both the school and candidate sides. To a large degree, the effects are related to the ordinal ranking of schools which both obscures important distinctions between law schools and overinvests particular features with significance. It's also true, though, that the format of the rankings makes it simple to compare law school raw data - like bar pass rates, LSAT's, and job placement - that rational applicants might consider in making matriculation decisions. Rather than being directed to schools by region, readers are directed to schools by ranking cluster. And web users of the U.S. News rankings can reorganize the data however they please. According to an email I received today, the new U.S. News survey will be released on the web on March 28. We've already seen lists that purport to be early snapshots of the 2009 rankings, and it's possible that the hard copy of the report will hit the stores early. One thing is for sure: Drexel will enjoy another year of flying below the radar (albeit this time with provisional accreditation.) Now that's freedom! Anyone Know How to Do The "Texas Two-Step"? Today’s the day we in Texas go to the polls - for the second time - to elect our Presidential nominee. Most of you by now have heard of our peculiar nominating process where we vote first by ballot, then by caucus. I cast my ballot last Tuesday, and tonight I thought I’d be ready and charged for my first caucus event. But instead I feel like Garfield. Not the former President Garfield. The cat Garfield, in a comic strip from years ago. If I recall it right, Jon was pondering the intricacies of the cat walk and asked his furry feline friend exactly how he did it. Paraphrasing, Jon asked, "Garfield, do you move both of your front paws forward, followed by your two back paws? Or do you move your front right paw and back left paw at the same time? Or maybe you move your front right, back right, back left and front left in sequence?" Jon waited patiently, but the answer never came, in part because Garfield is, after all, a cat. But also because thinking and doing are two separate things, and not only can cats not talk, now this one couldn’t walk. So today, as I ready for the big event, I’m trying not to over-think what comes naturally, or as close to natural as things become with practice. In theory nothing could be easier, particularly for someone like me, than helping elect a President. I vote wherever and whenever I can. I’ve voted in person on election day. I’ve voted absentee. I’ve voted using push-pins, and hand levers, and electronic voting machines (hate them, by the way). And having lived in Texas for four years, I’ve now grown accustomed to early voting, having done so at least three times. Rain or shine, big election or small (and the small one’s sometimes matter most), expect me there. I was voter #15 in the last City Council race, and that was about an hour before the polls closed. It was rainy. It was cold. Clearly no-one wanted to be there. But I was. Because history is made by the people who show up. And so I did. And tonight, at 7:15, I will show up again. To caucus. There’s only one problem. No-one here is quite sure exactly how to caucus . . .